The ice is open for the season. Enjoy! Many thanks to the volunteers. We do need more volunteers to share the burden. See more info below timetable. Statutory holidays and Christmas holidays (Dec. 25 to Jan.1) will run on the weekend schedule. We are looking for volunteers for a few hours per month to maintain the ice as part of a team. Please email: volunteerlead@rrroca.org for more information. We are also looking for donations to stock our new workshop. Anything from tools to peg boards to wall mounts to chairs! The equipment for the ice needs to be maintained and kept in good shape for our ice to be the best it can be! Donations can be picked up. Please email parks@rrroca.org for more information. There are sponsorship opportunities such as brand placement on the boards. Please email sponsorship@rrroca.org for more information. The idea for a Royal Oak/Rocky Ridge park began in 2008 with a community wide questionnaire when land was identified and secured for use by the Community Association. Follow up surveys provided additional feedback on preferred amenities and facilities and showed that the most highly rated facility was an outdoor rink. RRROCA’s mandate is to provide for the needs of residents, provide information and decision making, liaise with the City, and promote health and safety. There were currently no outdoor rinks in the community association area for our residents, as well as no park focusing on family and sports activities. The goal for the Community Park was to fulfill these needs for our residents. RRROCA developed a concept plan for an exciting community park to be located on reserve land east of the baseball diamond and William D. Pratt School at Royal Oak Way. The Community Association has a 15 year lease agreement with the City of Calgary for a community park. Residents may recall initial plans proposed by RRROCA in 2013 for a hockey rink in this area. While the community all season park still features a 65×150 foot lit hockey rink with boards and protective fencing, the park is now envisioned to include amenities that will entertain residents of all ages throughout the year. To learn more about the progress of the project, CLICK HERE to download the Community Rink presentation from the 2016 AGM. 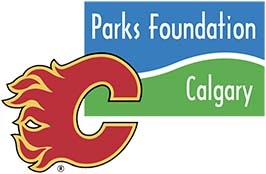 We would like to express our gratitude to Parks Foundation Calgary and the Saddledome Foundation for their generous support of our community park project.